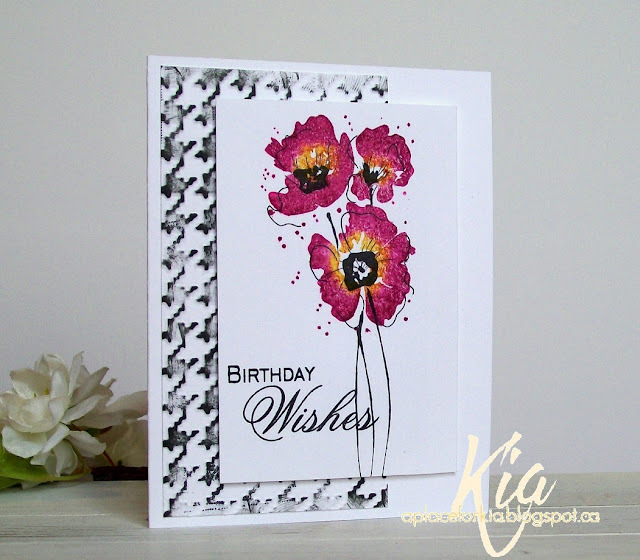 Sharing with you a few cards I made for the latest release from Frantic Stamper called Feminine Style. The card above uses the Lace Geometric Flower Doily, which is just beautiful and can be used in so many ways. I paired it with the Floral Blooms Stamp Set as I think it makes a pretty birthday card. I matted the underneath with gingham paper for a touch of spring, which one can only hope arrives soon. This is a very Clean and Simple card. There are times we are all in a hurry, this card fits the bill. I used one of the Bracket Edger with inserts along the right edge. 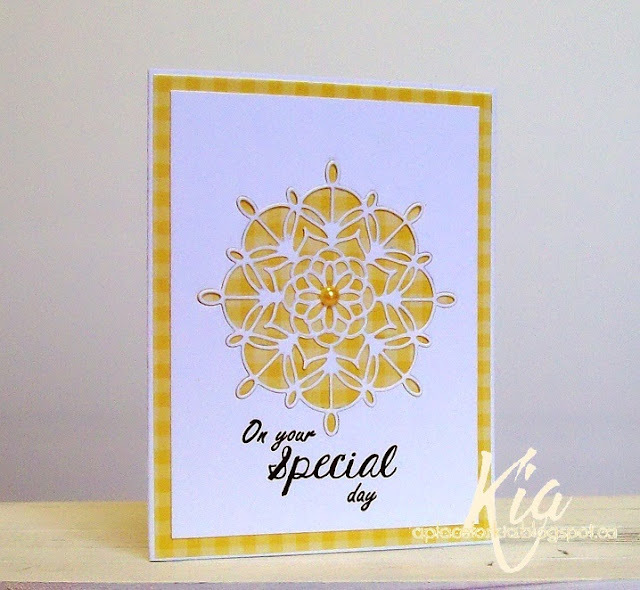 The flower is just one of the flowers offered with the Floral Blooms Stamp Set as is the sentiment. I would have to say this is my fave. I used the hearts from the Large Scallop Edger Set and die cut the hearts from several different papers. I then used the negative of the cut and placed the papers, being sure to change the pattern. I matted the hearts with red and stamped a beautifully simple sentiment from the Floral Blooms Stamp Set. And, finally my last card to share with you. A gorgeous Heart Rose die. For this card I did a watercolour wash for my background and once dry dripped some water droplets on it before cutting it out. I also die cut the heart in white cardstock, which is what I used for placement of the watercolour pieces. 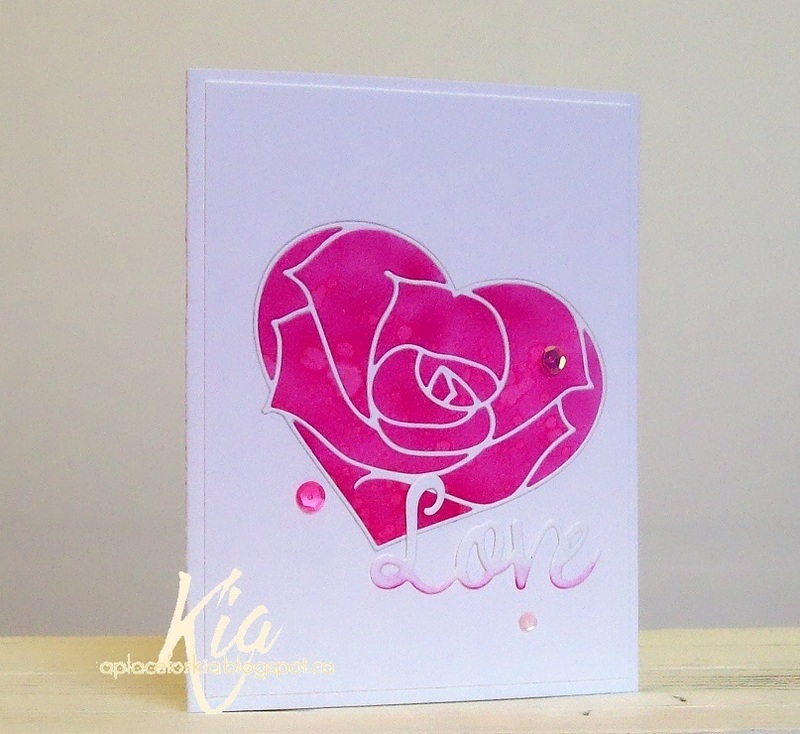 I then die cut the Love from the Faith Words #4 set and sponged on some of the pink ink at the bottom of the word. A few sequins finished my card. Products: All dies are from Frantic Stamper, Neenah Cardstock, Bazzill Cardstock, My Favorite Things Gingham Paper, Basic Grey True Love Paper, Tim Holtz Distress Inks Festive Berries and Crushed Olive, Simon Says Stamp Intense Black Ink, Winsor Newton Watercolours Permanent Rose, Kaiser Pearl, Sequins. Valentine's Day is fast approaching so time to get some cards done. 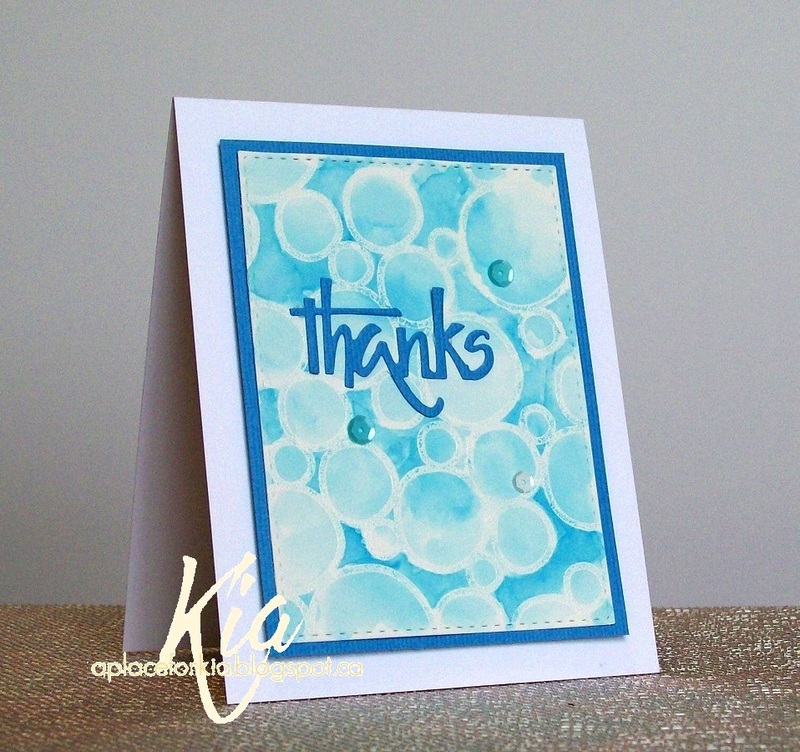 For this card I did a watercolour wash for my background. For the top panel I die cut the heart, then die cut the rectangle, attaching to my card base with foam strips. I die cut a few hearts and painted them with gold paint, hiding some under the heart so they are peeking out. To finish I added the love sentiment and a few sequins. A clean and simple card for Valentine's Day. Thank you for visiting today. Products: Simon Says Stamp Stitched Rectangles, Spellbinders Nested Hearts, Impression Obsession Heart Set, Neeah Cardstock, Fabriano 140 lb. Hot Press Watercolour Paper, Winsor Newton Watercolours, Fantasti/x Vegas Gold Paint, Foam Strips, Sequins. I am back from the mega Creativation Show held in Phoenix, AZ. My Sweet Petunia aka Misti had a booth introducing the new Creative Corners, which is what I used to do the shadowing on this card. There will be videos added to My Sweet Petunia's YouTube Channel showing how to use the corners shortly. I used Tim Holtz Distress Markers to colour the flowers and colour the sentiment for the shadowing. I matted in black and added a few sequins to finish. Thanks for visiting today. 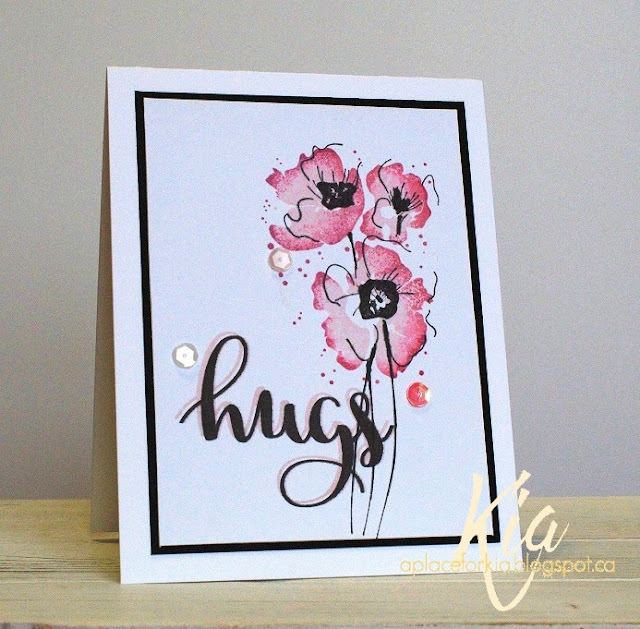 Products: Rubbernecker Field of Poppies, Avery Elle Simply Said Hugs, Tim Holtz Distress Markers Worn Lipstick, Festive Berries, Simon Says Stamp Intense Black Ink, Neenah Cardstock, Paper Garden Cardstock, Sequins. 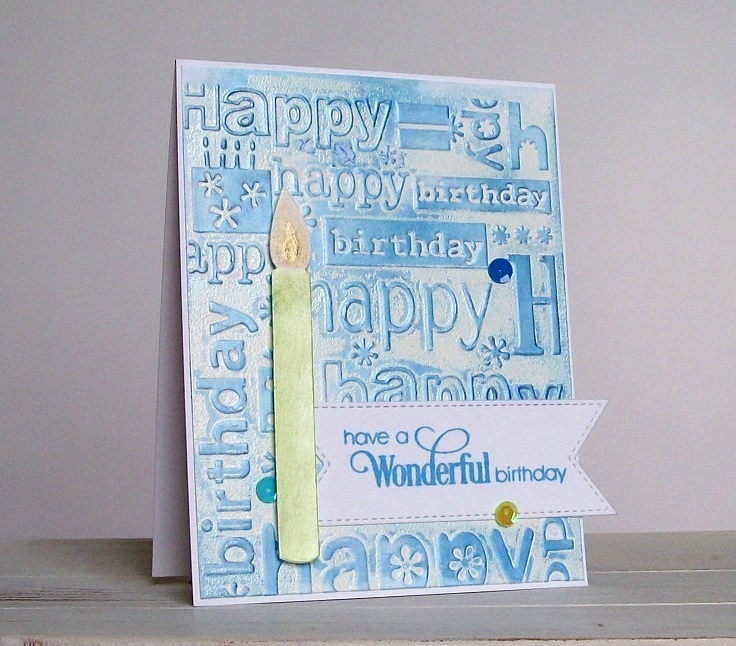 This is my sample for the CAS challenge at Splitcoaststampers today which is to work the word "freeze" into our card. I have been hearing about the ice storms on the news and thought of that while making this card. I wanted to do a background with alcohol inks but was out of glossy/yupo paper. I did have a piece of white mylar though, so I thought why not. I followed Loll's tutorial and put down the alcohol inks on some aluminum foil then smooshed the mylar into the inks. It was dry almost the minute I turned it upright! For my tree used grey paper and added glitter marker to parts of the limbs then covered the tree with Wink of Stella Brush and attached on foam dots. I die cut the sentiment twice in a thin strip of glossy paper that I found and dragged one piece in some of the Eggplant ink then shadowed with the white. And, yes there are sequins to finish. Thank you for visiting today. Products: Impression Obsession Bare Tree, Simon Says Stamp Hugs Sentiment, Neenah Cardstock, White Mylar, Adorpmdacl Alcohol Inks in Stream and Eggplant and Ranger Alcohol Ink in Sailboat Blue, Sequins. I love this colour called Cracked Pistachio from Tim Holtz Distress Inks and I thought it would look great with the pretty snowflake and the lines and circle background. 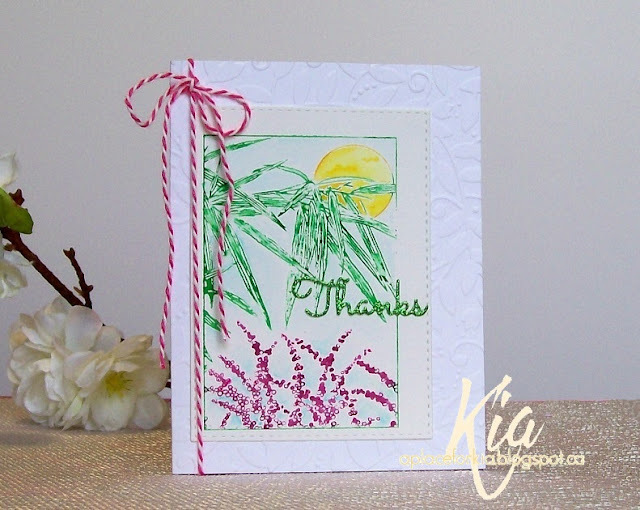 I heat embossed the background with white embossing powder then sponged on the colour. I attached the sentiment and the snowflake on a foam dot along with a few sequins to finish. It works perfectly for me for a winter thank you card. Thank you for dropping by. 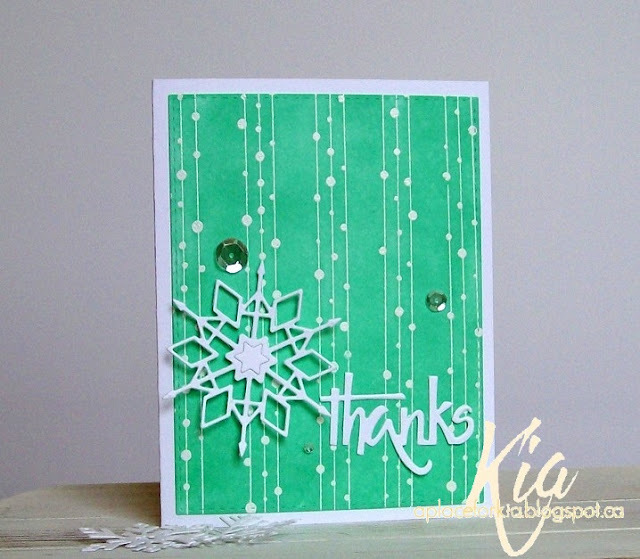 Products: Frantic Stamper Crystal Snowflake, Penny Black Lines and Circles Background Stamp, Simon Says Stamp Stitched Rectangles, Cracked Pistachio Distress Ink, White Embossing Powder, Neenah Cardstock, Sequins. As I have said many times, I am always in need of birthday cards so when I get an idea I go with it. I had coloured this flower image with markers and water and I wanted a black and white stripe paper for my background, but I did not have any. As I was going through my embossing folders I saw the houndstooth folder and thought why not make a background paper in black and white with it. Simply, I embossed my cardstock and ran my black ink pad over the raised area. I quite like the look so I went with it. I attached my floral panel to fun foam before attaching the panel to the card. I was so focused on my houndstooth I forgot about my sentiment - alas Misti to the rescue. I placed my card inside my Misti and inked up my stamp, and as the cardstock was on fun foam, it took several goes to achieve a good look. Thanks for visiting today .... I will see you next time. Having a little fun with the latest release at Frantic Stamper. If you happen to have a dog, this is how you feel about him/her. 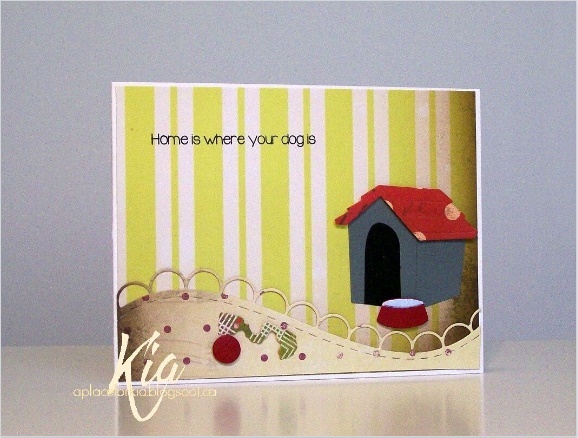 I used some of the accessories from the latest release called Pet Love, and the dog house from a previous release. To make my grassy hill I used the lovely loop edger cut from designer paper and attached on foam strips. I coloured inside the bowl with a pale blue to mimic a bowl of water. 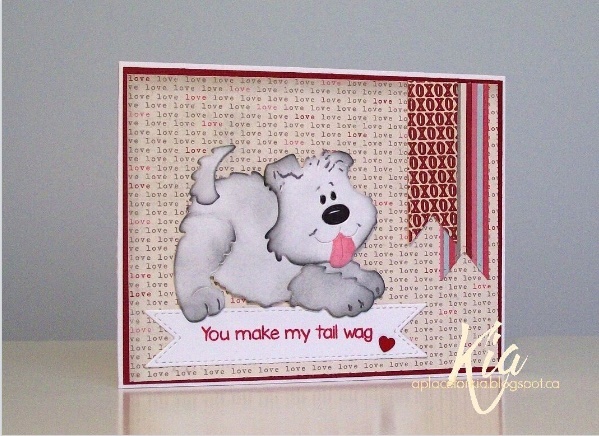 I think it is a great card to send to a dog lover for any occassion. Thanks for having a look today, see you next time. 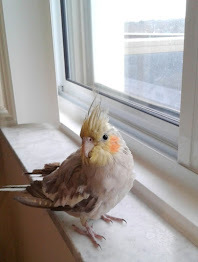 I cannot help but smile when I see this fellow. 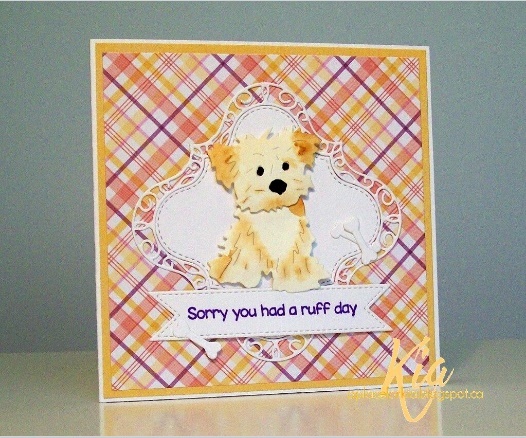 He is from the latest release at Frantic Stamper called Pet Love and his name is Poseable Jasper. He comes in several pieces so you can pose him how you wish. I coloured him with some charcoal ink and coloured is tongue with pink marker. I stamped the sentiment from the Dog Sentiment Stamp Set using the Double Fishtail Label and attached it under the dog paws. 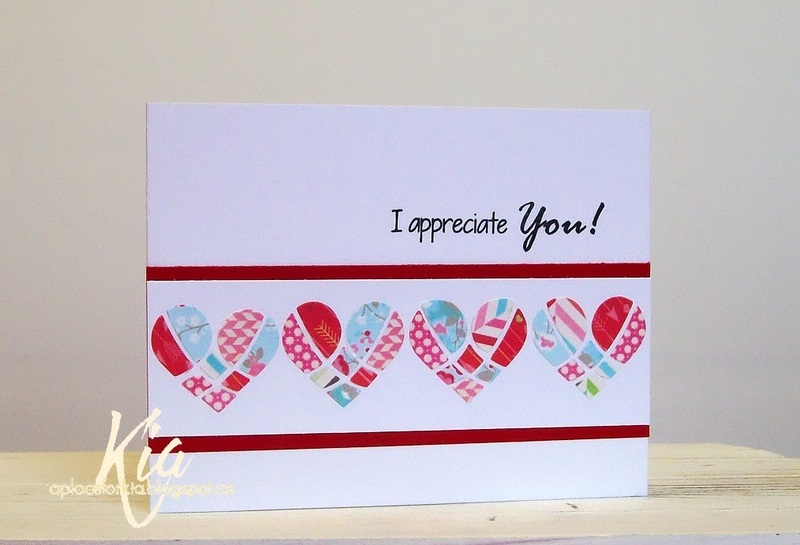 Keeping with the sentiment I used valentine designer papers, where I also used the fishtail labels for the tags. 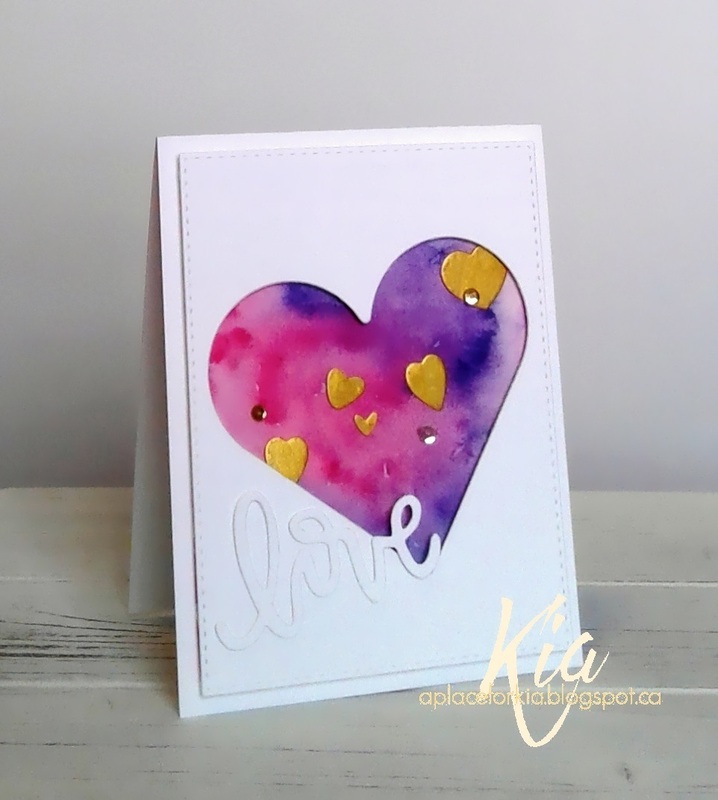 A little heart sequin finished this card. Thanks for visiting today. Products: All dies are from Frantic Stamper with links noted above, Neenah Cardstock, Paper Garden Cardstock, My Minds Eye Love Me Designer Cardstock, Charcoal Chaulk Ink, Tim Holtz Distress Inks Barn Door, Heart Sequin, Foam Dots. Products: Tim Holtz Splatters Stencil, Memory Box Texture Mesh Stencil, Frantic Stamper Stitched Double Fishtail Labels, Tim Holtz Distress Reinkers Tea Dye, Tim Holtz Distress Inks Festive Berries, Dreamweaver Embossing Paste in Glossy White, Natural Twine, Sequins, Fun Foam, Neenah Cardstock, Ranger Watercolour Paper. Products: Simon Says Stamp Stepping Stones, Simon Says Stamp Stitched Rectangles, Cuttlebug With Gratitude, Neenah Cardstock, Bazzill Cardstock, Fabriano Hot Press Watercolour Paper, Tim Holtz Distress Inks Salty Ocean, White Embossing Powder, Embossing Ink, Sequins. Products: Art Neko Framed Bamboo with Sun/Moon, Simon Stays Stamp Stitched Rectangles, Impression Obsession Greetings, Taylored Expressions Vine Embossing Folder, Neenah Cardstock, Green Glitter Paper, Bakers Twine. and Something Blue ~ the mouse background. I am always in need of birthday cards and I thought this embossing folder would look great in the blue, and I wanted to use my Nuvo Mouse again as I love the colours ... nice and cheerful with the snow outside. I heat embossed my embossing folder by applying embossing ink with my brayer and heat embossing with white embossing powder. I then applied the mouse with the finger tip and was surprised that the embossed area took the ink, but I liked that surprise. I was just careful about the area where I applied it. I did however want it on all the raised areas. For the candle, I put a tad of the mouse on my craft mat and added a drip of water, mixing it to form a little puddle and then dragged the bottom part of my candle through it. While waiting for that to dry I die cut the label and in my Misti I arranged my sentiment to the die cut stamping with a new ink to me from Altenew called Persian Blue, and attached to my card base. I then added gold Wink of Stella to the flame and with my Wink of Stella brush I spread the gold around the flame then attached to the card on foam dots. I really like how this turned out. 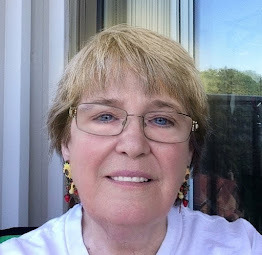 Thank you for visiting my blog today ... see you next time. Products: Cuttlebug Happy Birthday Embossing Folder and Candle Die, Penny Black Sprinkles and Smiles Sentiment, Frantic Stamper Double End Stitched Label, Nuvo Mouse Cornflower and Spring Green, Altenew Persian Blue Ink, Neenah Cardstock, Foam Dots, Sequins. I think it is time to start some Valentine cards. I do not have a significant other, but I do make many cards for friends, so I am always on the look out for images that I can use for friends. This Penny Black stamp is certainly one, and it is also fun to colour. 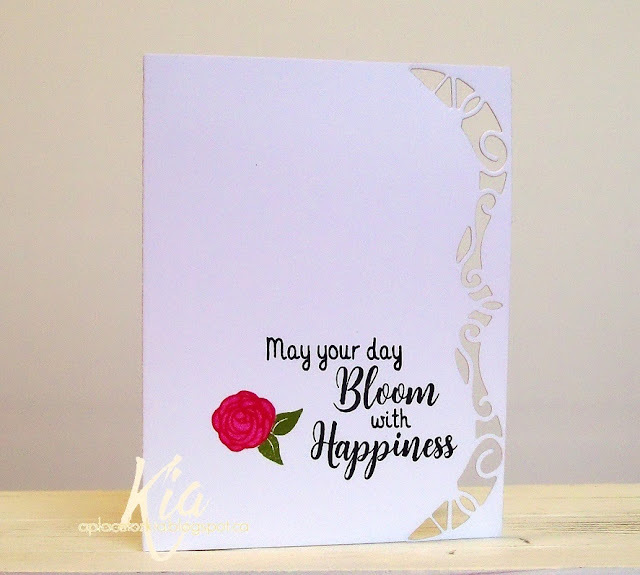 I used my Misti to make this card very easy to do and I used the colours from the colour challenge at Splitcoaststampers today, which are green, pink and blue. I arranged the butterfly and sentiment in my Misti and first stamped the sentiment with chipped sapphire distress ink, and removed it. I then coloured the butterfly with doCraft markers using green and pink and used black for the butterfly antennae, and once finished the stamping I coloured in the butterfly with the respective colours. I removed my card from the Misti and put in another piece of cardstock, and again coloured the image with my markers, then fussy cut each piece and sponged on the greens and pinks. I styled the butterfly and attached to my card base using glossy accents, and to finish a few sequins. Thanks for having a visit today. Products: Penny Black Valentine Dance, doCraft Markers, Tim Holtz Distress Inks Shabby Shutters, Peeled Paint, Spun Sugar, Picked Raspberry, Glossy Accents, Neenah Cardstock, Glossy Accents, Sequins. My first card in 2017! I would like to send wishes to all for a healthy and happy 2017. Birthday cards are always on the list of cards I need. I like having the time to just think about what I would like to do, and today was a lazy day, so perfect timing. I used a new stencil for my background today, and sponged with my beautiful Clarity Stamp brushes, that make stenciling so easy. I'll add a picture at the end of this post. 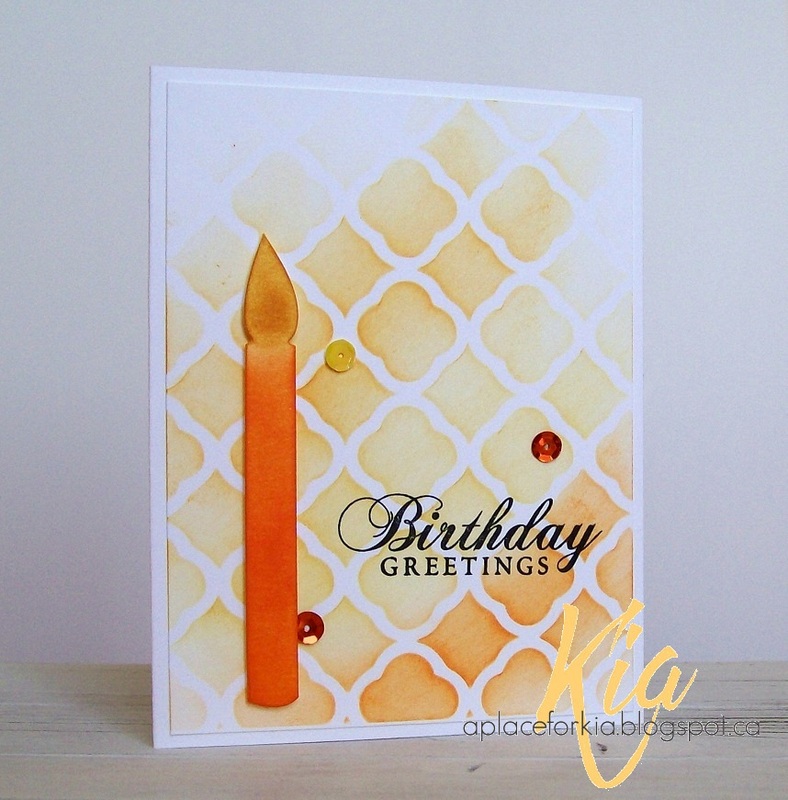 I used three colours of Tim Holtz Distress inks, sponging the light gold in the center and the different oranges on either side. I did not cover the entire panel, instead going lighter towards the edges. I placed the panel inside my Misti and played around a bit before making a decision on where I wanted my sentiment placed ... I bet we all do that. 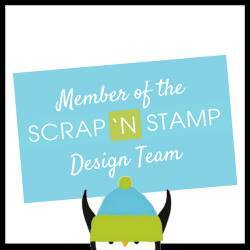 Misti made it much easier to do, as this too is a new stamp and requires more than one go at inking. This took 3 goes ... which is why I 💖 my Misti. I die cut the candle and sponged on the darkest orange and the light gold colour, and attached to my card on foam dots, and nothing has changed in 2017 ... I still love sequins, so I completed my card with a few. Thank you for visiting today. Products: Misti, ARTplorations Stencil Foiled Again, Impression Obsession Birthday Wishes, Cuttlebug With Gratitude, Tim Holtz Distress Inks Wild Honey, Spiced Marmalade, Carved Pumpkin, Simon Says Stamp Intense Black, Neenah Cardstock, Sequins. These are the brushes I mentioned above. I ordered them from Simon Says Stamp as I do not know of a company that carries these in Canada. They are fantastic brushes for stenciling. I would very much like more, one for each colour, maybe one day.